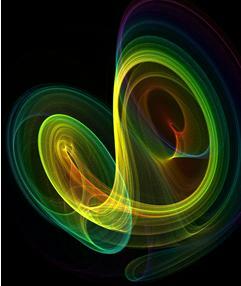 Chaos Theory – An Unpredictable Universe? A keyquestion in ToK is what can we know and what are the limits of our knowledge. Central to this, when it comes to the physical world, is the idea of chaos. Chaotic systems are those which are deterministic (ie. determined from initial conditions) and yet unpredictable – because small errors in approximating the initial state will lead to very large errors later. Chaotic systems may appear random – but really they contain patterns hidden within that randomness. The most well known example of chaos theory is the butterfly effect – to demonstrate how weather forecasting is affected by chaos – ie. a butterfly flapping its wings in S America might culminate in the creation of a hurricane in America. Tiny changes to the initial state lead to very large differences later on. Chaos theory can be linked to Mandelbrot and Julia sets (bringing in complex numbers), probability and statistics and fractals. It also has links with other subjects such as biology (emergent behaviour in flocks of birds) and economics (movement in financial markets).